Holy Cross Brother, known as "Frere Andre," has been associated with thousands of cures. 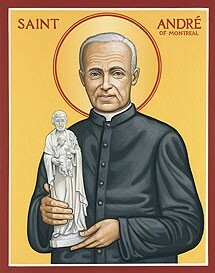 He was the founder of St. Joseph's Oratory in Montreal, Canada, which is the world's largest shrine in honor of St. Joseph. He died at the age of 91, then it was estimated that close to a million people came to the Oratory to pay their last respects.